Another day in the Vosges, this one almost a mirror image of yesterday as it’s not flat until the last 20km. Funny that, huh? 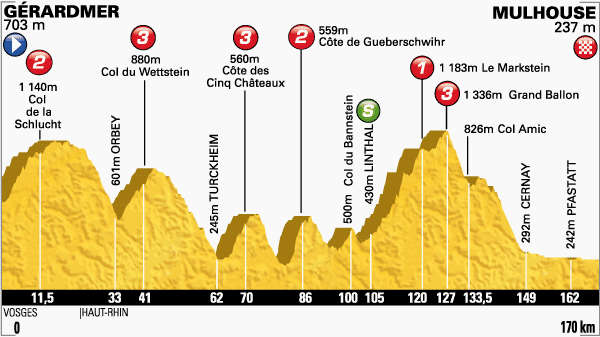 But it won’t be a sprint finish – not with six categorised climbs to get over. This stage might be one that has a race within a race. The six climbs will bring out King of the Mountain hopefuls (the pox! the pox!) while it will also hold the GC contenders’ attention. The stage starts with a cat 2 climb from the get-go and then it’s just up and down from there, including the first cat 1 ascent of this year’s Tour. Those in the GC race who can descend well might take some chances today, especially on the steep descent of Grand Ballon, although the 20km flat run to the finish gives those chasing ample opportunity to catch up. Jens Voigt, who is riding his 17th and final Tour de France, claimed the yellow jersey on a stage similar to this in 2005 so he might get sentimental and give the stage win a go. If not Jens, don’t be surprised if we see the stage claimed by a breakaway winner for the second day running.